Last month we posted some of the beautiful places to see across the country in May. With the Summer holidays around the corner here is our Top 10 Sites to see in France in June 2016. Situated in the 16th arrondissement of Paris on the southeastern edge of the Bois de Boulogne, the little known Jardin des Serres d’Auteuil is a haven of peace between the busy Parc de Princes stadium and the Roland Garros tennis complex. The garden is noted for its remarkable diversity of plants, from tropical to mediterranean species. The Cathedral of Rouen, Normandy is a jewel of Gothic architecture. The lofty sanctuary has the country’s widest church façade and the tallest spire (151 m). Rouen is definitely one of the most impressive cathedrals of France along with Paris’ Notre-Dame, Reims, Amiens and Strasbourg. There is so much to see in the Périgord province, from Sarlat to Brantôme and from Hautefort to Monpazier. Maybe one of the most visited sites is the medieval castle of Castelnaud perched on a rocky spur above the Dordogne Valley. Facing the castle of Beynac, Castelnaud will enchant young and old. This part of Provence, called the Luberon, is home to some of France’s most beautiful villages: Ménerbes, Roussillon, Gordes, Lourmarin… Another spectacular site is the Rustrel Colorado, East of Apt. The visitors will just be amazed at the bright colours of the former ochre quarries. It seems for a moment that this is not Provence and France anymore… make sure you visit the site on a sunny day! The dramatic Gorges of the River Fier near Annecy are a spectacular natural wonder with thrills guaranteed! Not far from the medieval castle of Montrottier, the deep, narrow gorges have been opened to the public since 1869 following the installation of a suspended footbridge, perched above the stream. With the Chain Tower on the left and the St. Nicolas Tower on the right, the entrance of the Old Harbour of La Rochelle (Vieux-Port) is somewhat dramatic! The two medieval towers were built in order to protect the entrance to the harbour and symbolise the power of the harbour city. Ideally situated on the flank of a mountain, Sainte-Agnès is a delightful village with magnificent views of the town of Menton and the Mediterranean sea. Labelled as one of France’s most beautiful villages, Sainte-Agnès is claimed to be the highest coastal village in Europe. From the village centre start great walks such as a two/three hour climb to the Pic de Baudon (1,264m), where one is rewarded with breathtaking views. 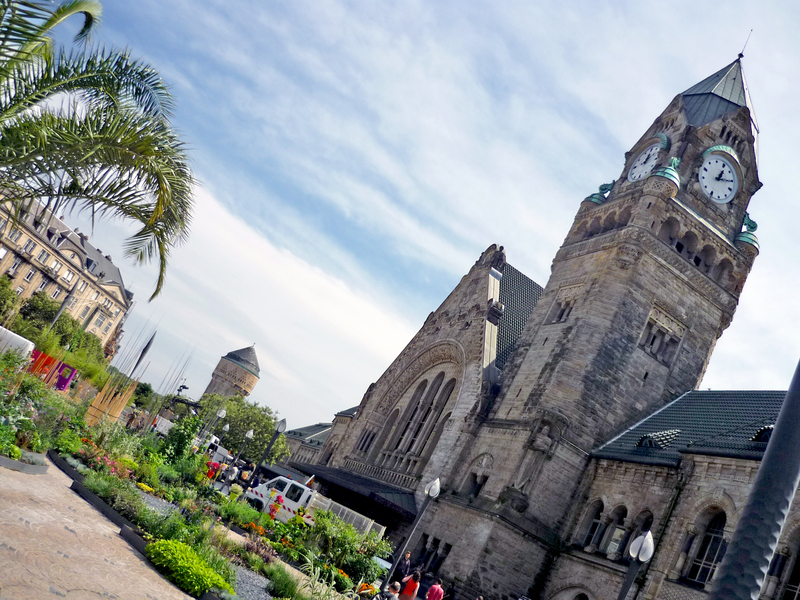 The railway station of Metz was designed by German architect Kröger and built from 1905 to 1908 in neo-Romanesque style as the flagship of the new town erected by the German. The Kaiser wanted the station to carry a great symbolic meaning, praising the power of the German Empire in the Lorraine town annexed in 1871. Just 43 minutes from Paris by TGV lies the little historic town of Vendôme. Criss-crossed by several offshoots of the River Loir, Vendôme reveals itself as a charming place to discover. This ‘Little Venice‘ features plane-tree lining the banks along the ancient rampart. The Pointe du Raz is a rocky promontory that falls into the Atlantic Ocean in Brittany. It is France’s second westernmost extent after the Pointe de Corsen. The Pointe du Raz takes its name from the Raz de Sein, a dangerous stretch of water that separates the continent to the island of Sein.